What Happened To Her Face? | Handling the questions with humor and grace. I’m the mother of a gorgeous little girl who was born in 2008 with a port wine stain the middle-right side of her face. We’ve received questions and comments on the mark since she was born, which is perfectly fine with me and my husband, but as she grows older and more self conscious I want to make sure we equip her to handle the questions herself. So please help us out! Have you (or your kid, sibling, parent, dog, anything) been the odd one out before? What questions did you get? How did you feel? What did you say in response? Please join the discussion! And as we encounter comments and questions, I’ll share our experiences here, too. Quite simply, I’d like to have some small idea of what attitudes or questions a girl who has an obvious mark on her face might encounter as she grows older, and to ultimately teach her to respond to it all with humor and grace. To join the conversation, simply comment on any of the posts here, and share your thoughts. (And just for fun, please tell me what state or country you’re from.) Thank you! Congratulations! You have welcomed a new baby into this world. You are excited, happy, terrified, uncertain. And that baby looks nothing like what you expected. If you, too, have been surprised by your perfect newborn’s unexpected face, I can perhaps offer some insight into the things you’re worrying and wondering about. You already knew that you’d have to navigate the challenges of raising a child in this complicated modern world, but you weren’t prepared to do it with a strange-looking face. You may be torn between calling your perfect little infant “perfect” and wondering what to do about this looming flaw. Should you call it a flaw? Will she think she’s not perfect? Should you mention it to her at all? You will Google this condition, and when you see all the ways these errant blood vessels can invade the brain, the eyes, the nose, and the gums, you will start watching for every daily milestone to make sure all systems are working the way they should. At least, for now; those vessels will keep growing. You will feel guilt at your concern over your baby’s face while other parents are dealing with issues so much more deep, painful, and immediate than this ‘cosmetic’ issue; yet, when someone else tells you to be thankful that you have “only a cosmetic issue” to deal with (and maybe even that “it’ll go away”), you’ll want to cry. You will worry over every contact sport, every scratch, and every nosebleed, along with her eyes, gums, tongue, teeth, brain, and anything else these overgrown blood vessels touch. When it comes to her looks, you will struggle in the balance between truths – the truths that other people tell you, and the truths you discover for yourself. People will tell you your baby is beautiful, and that’s true. They will tell you that your child will be absolutely fine sporting a birthmark in our enlightened modern era, and that’s true. They will tell you that beauty is so much deeper than skin, and that’s true. They will even tell you that people hardly notice it after they meet your child, and that’s true, too. But it’s also true that the uniqueness of each birthmark means that your child may never see another human being like them, and that’s isolating. It’s also true that your decision to treat, eliminate, remove, or otherwise ‘fix’ this error will haunt your parenting conscience whether you choose to leave it or not, and that’s sobering. It’s also true that our human instinct to spot aberrations in nature means that your child’s errant face will never not be spotted, and that’s overwhelming. It’s a worrisome thing to raise a child with a strange face. It’s okay that you’re dealing with those worries; it doesn’t make you a shallow person. And you may not feel validated when people encourage you with all the truths about how cool it is to have a birthmark now; they’re not wrong; it just doesn’t feel validating. That’s okay, too. Take their encouragement; consume the truth they’re giving you. You will think ahead to the first day of preschool, and the first day of kindergarten, and all the other firsts that she will walk into. How will she carry herself into the room? What will she say? You will find yourself noticing all the unique features in other humans now. And every time you see another human with a Thing on their Face, you’ll devour every hint that might give you clues to your own daughter’s future, all the way down to the way that one birthmarked guy orders his ice cream, and the way that one birthmarked girl slouches into her hoodie. Ashamed? Is that what your perfect, brilliant, precocious infant daughter will become? People can assuage you all they want, but let me tell you, when you think ahead to all the things you have to prepare a daughter for these days, and then plan on having a weird face on top of it, it’s overwhelming. You may not know what to do with all the overwhelmingness. You may be quick to feel indignance: How dare Disney not have a princess that looks like my daughter? You may be quick to feel offense: How dare that ignorant idiot ask my daughter what’s on her face? Take a deep breath; be patient with all the other flawed humans around you. They may not validate your concerns; they may not accommodate your daughter’s face, or even anticipate it. They may ask loud questions. That’s okay. Have grace for other humans; give them room to err, because they’re imperfect, too. Have a sense of humor; dress your baby up as a Dalmatian puppy on Halloween and call her ‘Spot’, because you only live once. We’re reluctant to embrace vanity, but when we’re honest, we would admit that we desperately want to conform, we want to look “like”, and we want to be seen as pretty. This is our vanity, and we feel guilty for it, and a facial mark rocks that guilt. It may feel better to preemptively blame other humans for not accommodating your daughter in their princess lineup, but I think it’s healthier to admit that a natural dose of vanity comes with being human. It doesn’t make you a bad person. It’s okay to worry about all of this, and then it’s okay to let it all go and take “Spot” trick-or-treating. Parenting is always uncharted territory. Every child is unique, and every day is new. I can give you advice, I can tell you what we’ve learned; but, ultimately, you will make your own path. I’ve walked some of your steps, but not all of them. And as I learn from each of our steps, I will continue sharing what we’ve learned with you, here. But in the meantime, please know that I’ve felt what you’re feeling, and I can tell you, after more than a decade of parenting a Kid with a Thing on her Face, that it’s all okay. Addy may not remember being dressed up as a Dalmatian puppy named ‘Spot’, but she thinks the pictures are hilarious. She’s fine. It’s all good. For Addy’s first few years of life, she lived by a cycle of monthly laser surgeries: she was at Children’s Hospital for a new surgery every month; three weeks later, she’d go to the clinic for a pre-op checkup, then go back to the hospital for another surgery the following week. Three weeks later, another pre-op, then another surgery; then another pre-op, and another surgery… you get the cycle. The surgeries are minor, thank goodness, but many. She’s had 43 laser treatments (so far) under anesthesia beginning at 5 weeks of age, each one variously bringing IVs, yucky-tasting drugs, and masks covering her face, and each one preceded by a pre-op appointment with a clinic doctor the week before. Every medical encounter, with all its variables, carried the risk that Something might happen to turn her off from medical appointments. Shots, exams, drugs, questions, strange surroundings, weird lights, being transported in a moving bed – all of these things can be painful or disorienting, and the likelihood that Addy might end up hating all things medical was always high. Yet you’ve probably noticed (here, here, and here) that for Adelaide and her Port Wine Stain, medical settings are happy places. So how did she arrive at her love of all things medical? Why is she so comfortable as a patient? I hope that for any parent reading this who has a child requiring a minor (if frequent) medical procedure, our insights here might help smooth the experience. 2) some very intentional parenting at every single appointment. Seek out children’s medicine if at all possible. All of Addy’s surgeries have taken place at a Children’s Hospital, where every single worker is oriented to children, not just as smaller versions of adults (which they’re not), but as their own species. Their bodies are different. Their brains are different. One can’t always explain things to a kid, one usually can’t reason with a kid, and one forgets what frightens a kid’s brain, but at Children’s, all these things are on the radar of every nurse, receptionist, doctor, assistant, and specialist. That’s not to say that they’re all perfect all the time, but it’s a great place to start. Outside of Children’s Hospital, our other providers ‘get’ kids, too. Her primary care doctor is a pediatrician. Her dermatologist, while not a pediatrician, is a laser expert who specifically treats children with port wine stains. Her ophthalmologist is a pediatric ophthalmologist (glaucoma is one of the possible complications from a port wine stain), and I can’t imagine trying to do that long, strange appointment with anyone other than a children’s eye doctor. At these appointments, we’re just as likely to be asked about favorite cartoons as we are about recent colds. The pediatrician doesn’t just look in her ears at a checkup, he ‘looks for’ Disney princesses or Marvel characters. The ophthalmologist speaks more to Addy during her eye check than to me, and that’s perfectly fine. With so many opportunities for bad experiences, taking your child to a provider that understands children is a great place to start. The second major factor: the parenting. If you want (or need) your child to be comfortable in medical settings, then you need to intentionally parent through every medical encounter, even the small ones. You’ve seen some of my specific tips before, but this provides some wider context. Choose your attitude wisely, for your child will absorb it and then reflect it. Be positive. When you visit a Children’s hospital a lot, you pick up on certain patterns, like this one: no matter the personality of the child, they’ll always end up reflecting their parents in the waiting room. Pre-procedure parents are either Relaxed & Happy, or they’re Nervous About What’s Coming (complete with pursed lips and bulging neck veins). They’re either smiling with their child, or tensing up like a guitar string about to snap. Can you guess what happens to the child in those few minutes in the waiting area? Within moments, they absorb the signals emanating from their parent, and then they unconsciously match them. Happy parents? Happy kid keeps playing. Tense parents? Kid does a double-take at the awesome toys in front of him, decides that maybe there’s something sinister about them, gets really quiet, goes over to Mom & Dad, and sits quietly, whining occasionally. When it comes to your child in medical settings, remember that YOU set the tone. You are the sky, and your child is the lake. If you’re sunny and bright, then the water shines brightly, too; if you’re cloud-covered and gloomy, then the water is grey and cloudy, too. You carry immense responsibility. Your child will reflect you. If you want them to come out of a clinic appointment happy, then you can’t walk in like you’re about to get that awful shot you got back in 1998. If you want this surgery to not be a negative experience, then you can’t walk into the hospital looking like you’re on your way to a funeral. If you want your child to comfortable in medical settings, then you must first be comfortable here. And if you have to fake it ‘til you make it, then fake it, because your little copycat is taking their cue to be either happy or terrified from you. Don’t lie about anything (more on that below); just make sure that their starting point isn’t “terror”. Remember your child’s natural ignorance. Now, this ignorance comes with a bonus: Kids aren’t born knowing that medical stuff is bad. That’s the burden we adults carry because we’ve visited hospitals when loved ones are at death’s door, when accidents change our lives forever, when babies are born dangerously early. We understand life and death, and we know that the treatment can hurt more than the disease; if we had to check ourselves in today, we’d probably freak out. So we expect the same trepidation from our children. But to your child, all of this is new. And a child is accustomed to encountering new things every day; that’s part of being a young human. They’re constantly facing unfamiliar people and experiences and objects, whether at the grocery store or the hospital. There’s no need for any of it to be negative at the start, so don’t heap that upon them. They’re starting fresh. Marvel at the blood pressure cuff with them – isn’t that cool how it works? Handle the mask together and laugh about how it looks on your face. Explain what these things do. Mysterious unknown objects can be scary; familiar everyday objects aren’t. Get a ‘play doctor’ kit with a stethoscope and blood-pressure cuff. Ask the hospital if you can take home a mask so you can play ‘surgery’ at home and have a blast. Let them be curious, help them explore, and keep everything positive. Some people want to distract a child so they don’t see a shot coming, and then they sneak it in, thinking that it makes the overall experience shorter and easier. Trust me, that only works once. The child cannot logically process, “Well, gee, that was SO much more efficient.” All they know is, “OWW!! What?!? !”, and they will never, ever, ever again trust that stranger in the white coat, or even you in that environment. Which means that the next time you carry them into a clinic or hospital, they’ll be inconsolable. When I was a child, I was a patient in a hospital that wasn’t a children’s hospital. No one there knew how to handle kids, and they administered shots by the ‘distract & surprise’ method. It didn’t take long for me to distrust every white-coated person I encountered thereafter; I even freaked out if I saw a white winter jacket outside the hospital. The tech would prepare the shot. That’s right, he made her politely thank every tech and nurse who took care of her, even those who administered shots. An attitude of thanks may sound crazy, but for a little toddler, the effort of articulating polite words of gratitude provided enough of a distraction (after all, that’s a lot of work when you’re two) to get her mind off any lingering pain from the quick shot. And it fended off any possible “poor me” wallowing that could creep in among her many medical visits, to acknowledge the role of all caregivers around her, even those stuck doing thankless tasks. No surprises. Medical procedures don’t have to be pleasant, but they definitely should not be a surprise. Ever. Be your child’s activist when it comes to details of treatment. Even in these great settings, we occasionally encountered providers who weren’t perfect. One clinic nurse was so nervous around kids that she clumsily administered a “surprise” shot to the leg really hard, without giving Keith a chance to count Addy to three. Bad idea. Addy felt shocked & betrayed, it took Keith over an hour to calm her down, and the poor kid limped for a week. Not a good thing when we were bringing her in for a medical appointment or procedure every 1-3 weeks. Needless to say, we were more demanding of procedure thereafter. We had a lot grace for the nice nurse’s nervousness (after all, no sweet soul actually wants to administer shots to children), but we did discreetly discuss the event with the clinic, and they were awesome. They understood that we couldn’t afford to have Addy not trust us, and they helped ensure that all shots thereafter followed a trustworthy procedure. Remember, again, you’re in control. Your child takes their cue from you, and the providers take their cue from you; if you’re not comfortable with some aspect of treatment, they’ll probably work with you until there’s some resolution. But they can’t read your mind, so speak up. Be kind and courteous, and they’ll work with you. I was surprised one morning when a nurse at Children’s Hospital offered to let Addy take out her own IV after a surgery. Taking out the IV has always been a nasty moment, mostly because of the adhesive sticking to the skin. (The needle is nothing compared to that sticky hand-hair-grabbing tape!) Addy was always apprehensive about getting the IV out. But then the nurse showed Addy how to pull it out herself, and it turned that moment from one of apprehension to one of empowerment. Addy learned exactly how the IV worked, where the line was, and how fast to pull off the tape. Altogether, it made her feel awesome. No more tears. Expect great things of a kid, and they’ll rise to the occasion. I’m grateful for that nurse’s wisdom; she knew Addy could handle the task herself, even if I didn’t. Keep your eyes open for opportunities to let your child do things for themselves in medical settings; ask the provider if a task can be done or assisted by the patient herself. The IV task has been rather empowering for Addy, and there might be others. The providers can help you find ways to empower your child to do things themselves, especially if they’re used to working with children. Yes, perhaps you’d rather be at a tropical beach than at yet another procedure, but honestly, it could be worse, and in the grand scheme, it’s really not so bad. So enjoy the little stuff; get excited about stickers and pumped about popsicles, because then your kid will, too. Savor the time with your child (and a good book during those precious quiet minutes when they’re under anesthesia). Life is beautiful, this laser treatment stuff isn’t so bad, there’s a whole team of people taking care of your offspring. And with luck, your offspring will realize that it’s all quite lovely, too. So, you’re going to bring your child in to get zapped! Congratulations. I always applaud treatment, because I know that some parents have struggled to get sufficient medical advice to understand that, no, this birthmark isn’t going away on its own, and will in fact only grow with the child. So treatment is an excellent step forward. 1. Get it done under anesthesia. There are doctors who treat port wine stains without general anesthesia. I think they’re crazy. Here’s why. A few years ago, my son developed a little red-dot hematoma on his cheek. It, too, needed a laser treatment. Since it was so small, Dr. Z. (Addy’s dermatologist) told us to just come into his clinic, where he would do a quick zapping with a bit of topical anesthetic. That’s the normal practice for the fancy clients who want their unwanted capillaries zapped. It gave me a chance to see what’s usually done behind closed operating-room doors. So we went in, put on special sunglasses, and helped hold Clarence while the laser zapped him. It was noisy! And powerful! Like lightning suddenly exploding: BZZZZ! BZZZZ! BZZZZ! Pause. Then again: BZZZZ! BZZZZ! BZZZZ! The impact to the skin is often described to us by adults as “being snapped by a rubber band over and over, a hundred times a second.” BZZZZ! I could see the impact on the skin. We had to wait through a moment of silence, then: BZZZZ! Another moment of silence, then BZZZZ! Clarence was a trooper, but he did cry a bit. That was zapping just a tiny spot on his cheek. When we were all done, Dr. Z. looked at me and said, “Now you can see why we do port wine stains under anesthesia.” Yes, sir, INDEED, I can. The sheer acreage of a port wine stain demands it. These are not little varicose veins or spotty hematomas – they’re big and spacious, and need *gridwork*, not *spotwork*. Why am I telling you this? So that you can feel confident in your provider’s choice to put your child under anesthesia. Some parents (and even some professionals, and definitely the coverage providers) feel uncomfortable putting children under anesthesia. They may quote a report that came out a few years ago vaguely linking multiple trips under anesthesia in a child’s first two years with later behavioral issues like ADD. But what usually isn’t addressed in those conversations is the fact that children who require multiple surgeries in their first two years of life might have complicated medical issues, and that it’s just as likely that the later behavioral issues are caused by the underlying medical condition, the effects of it, or simply growing up in a hospital, and not by any long-term effect of anesthesia. Port wine stain cases are unusual in that, in spite of the need for multiple surgeries, there usually isn’t a major underlying medical condition affecting development (except for Sturge-Weber Syndrome), so we really don’t have much to worry about. Addy’s had forty-three trips under anesthesia, and she is (in my humble opinion), a well-adjusted genius. I can’t recommend anesthesia heartily enough. Anesthesia takes what could be a difficult and stressful experience (“BZZZZ!”), and turns it into a glorified nap. Let me repeat something from the last sentence above: from your child’s perspective, all she will experience is *a glorified nap*. Parents, please remember that when you bring your child in for a laser treatment under anesthesia. There is no great terror here. You will be STRESSED BEYOND BELIEF. That’s okay, you’re her parent, you’re *supposed* to be stressed when your offspring is taken from you and given a gas to knock her out. Totally natural. You wake up from your nap. You eat popsicles after your nap. BEST. DAY. EVER. That’s pretty much it, from your child’s perspective. Here’s the key: whether this is a positive or negative experience rests in your hands, parents. No matter how stressed you are, you must help your child see everything new in a positive light. You are the sky, she is the water, and she’ll reflect your attitude. Be sunny. Think of a first ride on a rollercoaster – it could either be terrifying or exhilarating, and a child watches their parent’s reaction to help determine whether the New Thing is terrifying or exhilarating. Help her enjoy her day by pointing out the pretty mural on the wall. Help her get excited about the hospital pajamas, no matter how ugly they are. Tell her to thank every nurse and tech and doctor who dotes on her, even if they’re just flatly doing their job. Point out how awesome it is that she gets to play with toys, even if she has the same ones at home. Act like the mask with the crazy gases is worth smiling about. When she wakes up, help her procure popsicles and be amazed together that she’s eating popsicles at that time of day, without even eating lunch, and make it sound like the best day ever. You’re gonna cry. Accept that, make peace with it, stash a tissue in your pocket, and be ready. They’re knocking your baby out. The tears come, whether you want them or not. Your maternal instinct will DEMAND that you tackle the people wheeling away or putting a mask on your baby. “YOU TOUCH MY BABY, YOU DIE.” It comes up suddenly. It’s unexpected. And you were feeling so civilized today. To avoid getting arrested, suppress this instinct as much as you can. Good luck. Allow yourself to glance at the other families, patients, anyone else you see. Pretty much every single one is fighting a harder battle. This helps keep you grounded & sane. Addy has enjoyed something about every surgery. She looks forward to each one. She wants to go back to see Dr. Z. and all the wonderful people at Children’s who dote on her and give her toys to play with and popsicles. Next week, I’ll share a bit more insight on how we got her to like medical procedures, because a lot of intentional parenting went into it. But in the meantime, let me share a few other things to keep in mind that will help your whole week go better. In the days leading up to a surgery, play around with putting things in front of your mouth and your child’s, like an anesthesia mask. Make something out of a brown paper lunch bag if you have to – the point is to get her comfortable with something safe in front of her face. (Okay, here’s the obvious but necessary caveat: don’t use plastic bags or anything unsafe. Feel free to teach her the difference here.) Make it a trumpet; try breathing into it; play doctor. Play, play, play! Then, when an anesthesia mask is really put on her face, rather than freaking out (“Get that weird thing away from my face!”), she’ll recognize the game. There’s an “anesthesia hangover” that lasts about 3-5 days. Your child might be weirdly more emotional than usual. More likely to break down and cry. Emotionally fragile. That’s just the anesthesia hangover, and it will pass. Warn her teachers, warn her caregivers, and warn yourself. She’s fine, just a little emotional. Give her grace. You probably won’t experience this, but there’s such a thing as “emergent delirium”; this affects mostly 3- and 4-year-olds, and occurs when a child ‘wakes up’ and appears functional, but their brain is still anesthetized. This happened to Addy at age 3; she seemed to wake up, but was still weirdly fogged. The ‘disconnect’ between awake & asleep brings on some unexpected behavior. (In our case, massive tantrums.) If you see your child completely breaking down post-anesthesia, don’t worry; she’s probably just processing the rest of the anesthesia, and IT WILL PASS SOON. Suddenly, the clouds part, and the child is normal again. The nurses can help you navigate this if it happens, but again, it’s unlikely. These laser surgeries are nothing. No scalpel, no stitches, no chemo, no major complications. And yet they’re a big deal; you’re watching your child get knocked out for a medical issue, and your Maternal Instinct will be aroused. (DOWN, Mama Bear!) Allow yourself to maintain the perspective that this is a light burden, and that it comes with the blessed opportunity to help our children navigate the modern world with lovely marks on their faces, and to endow them with depth of character early in their young lives. But just, like, try not to punch the nurse. Okay? Okay. Parents, if your darling new baby has a red birthmark, you will want to know the difference between a port wine stain and a hemangioma, two common types of vascular birthmarks, and what some of the related complications might be. I can tell you what I know – which, admittedly, isn’t much, and is, I’m afraid, heavily anecdotal. But, no matter; I’ll still share it. 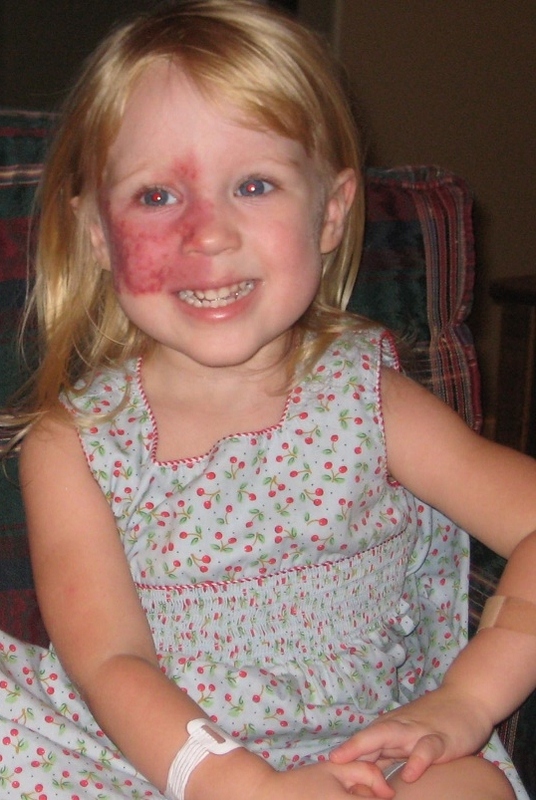 A port wine stain, which is what Addy has, is usually flat at birth, but then it grows over time. That growth means that a port wine stain will often become raised & nodular, especially if left untreated. A port wine stain is a proliferation of blood vessels associated with a particular nerve. That nerve, otherwise responsible for telling its partner blood vessels in utero to “Stop growing!”, missed giving that critical signal at some point during development – so the blood vessels kept growing and growing. (In Addy’s case, the error is associated with the middle branch of the trigeminal nerve, on the right side of the face.) As a result, the capillaries are abnormally wide in diameter (like, over 40x wider). A hemangioma, on the other hand, is raised at birth – you can feel it if you run your finger over the skin – and it may grow a bit in the first year, but then it will recede or ‘implode’ on its own. A hemangioma is a cluster of blood vessels by the surface of the skin, sometimes medically referred to as a benign ‘tumor’ of blood vessels. It’s often very bright red. These are the common “strawberry marks” we all know on babies. They usually fade on their own. I can’t tell you how many birthmark misdiagnoses I’ve heard. Many of them were directed to us by well-wishers, including nurses who told us “Oh, that’s just a hemangioma, it’ll go away!”; others have been directed to some of my readers by aloof primary-care doctors who weren’t familiar with port wine stains. Get your child to a specialist who understands vascular malformations (a good dermatologist should know the difference), and get the right diagnosis. Here’s why: if your child has a hemangioma, it will probably disappear on its own, and if it doesn’t, well, you can cross that bridge when you get there. But they usually go away without intervention. If your child has a port wine stain, though, it will not go away on its own; in fact, it will grow with your child. And as your child develops, their blood vessels and the skin above them will only develop & toughen, making it harder to eliminate the stain later. The worst medical advice in that critical first year is “Ehhh, let’s just see if it goes away on its own.” It won’t. It will only toughen. We were lucky – Addy went in for her first surgery at 5 weeks old, and had 9 more before her first birthday. Complications can arise depending on how ‘deep’ the birthmark is, and where it’s located, which are determined by when the error occurred in utero. If the error of a port wine stain occurred earlier (i.e., the nerve missed giving that critical signal to “Stop Growing!” to its associated blood vessels), then the port wine stain will be deeper in the skin, and wider on the body. For example: Addy’s stain covers much of the right side of her face (along the V2 branch of the trigeminal nerve), and is relatively difficult to treat, hence the 43 surgeries so far. It’s deep. Meanwhile, her friend has a small stain along the exact same V2 branch of the trigeminal nerve, but it’s the size of a half-dollar coin on her cheek, and it disappeared after a half-dozen laser treatments. That’s because the friend’s error occurred later in utero, while Addy’s occurred earlier. Other kids have massive vascular malformations that erred even earlier than Addy’s; one young woman told me that her brother was born with a large one that totally covered one shoulder and down onto his back, and it was so large (and deep, and thick) at birth that the doctors weren’t sure if he would be okay. He avoided contact sports, but otherwise has been living a healthy life. Depending on where the stain is, a port wine stain can cause other complications. For example, if the stain is on the V1 branch of the trigeminal nerve (the optical branch, along the forehead), the risk is significantly higher for Sturge-Weber syndrome, which is a constellation of issues stemming from having malformed blood vessels in the head, including calcifications in the brain (which can hinder brain development) and seizures. An MRI helps diagnose Sturge-Weber issues in the brain. Since Addy’s port wine stain touches onto her forehead, she had an MRI at 5 months of age, to make sure that there were no vascular malformations in her brain; all was clear. But glaucoma is definitely a concern, since the proliferation of blood vessels can also cause undue pressure on her eye. She is checked for glaucoma annually. Of course, glaucoma isn’t the only eye issue; as you’ve read here, Addy’s tear drain was pinched off by the pressure of all the encroaching blood vessels around it. She had a tube put in a few years ago to try to prop it open. Even though it fell out shortly afterward, it did successfully open up the plumbing for a while, and it bought her some development time. Unfortunately, she’s been tearing up again in her right eye, so we may have to do it again. The port wine stain is also in her mouth. This is fascinating! As the right and left sides of the head develop in utero, they ‘meet’ in the middle; thus, any error tends to only show up on one side of the face. Addy’s face is split down the middle, even down to her tongue and uvula! If you ask her to open up her mouth, you’ll see her tongue is half red, half pink – and if you look farther back, even her uvula is precisely half red, half pink. The extra bloodflow to the right side of her mouth meant that her teeth developed earlier, and popped out of her gums earlier. (And, luckily, they popped out fast. Teething wasn’t so bad!) As a baby, she had an adorably lopsided smile for a short time until her left side came in. But now, all that extra bloodflow and tooth development means a lot of crowding; the well-populated, well-nourished right side of her mouth is crowding out the left, and an extra tooth is popping in above the others (affectionately called ‘The Snaggletooth’), because it doesn’t have any place to go. So, we can add significant orthodontia to our 2019 budget. When she brushes her teeth, bleeding from the right side isn’t uncommon. In the wintertime, she gets one-nostril nosebleeds on the right side. We try to minimize all possible injury to her face, gums, nose, and scalp on the right side, because she bleeds more than the average bear in those places. And, if you look closely, you’ll see that her bones are actually a bit bigger on the right side of her face, due to the extra bloodflow. It’s not actually a problem (or even noticeable) for Addy, but I know another little girl with a port wine stain who had to see a craniofacial surgeon to see if anything could be done about some too-fast bone growth along her stain. So, there are complications to these port wine stains. Hemangiomas probably bring various complications, too, especially very large ones, but my experience is limited to port wine stains on the face. These are simply some of the things we’ve watched & worried over with Addy. Each birthmark is unique, so please don’t hesitate to contact me with questions and pictures if you want a mom’s advice. I’m not a doctor, and I will tell you to ‘get thee to a dermatologist’ if you haven’t yet, but I’m happy to navigate these waters with you. Also, among blood-red marks, there’s even a third type after Port Wine Stain and Hemangioma: Hematoma. In short, a hematoma is a red spot that looks like a hemangioma, but it usually comes about by injury or disease. Clarence ended up with a small hematoma on his face after an injury, and he got to have a laser session with Dr. Z., but I’ll tell you more about that in another post. So, there: you’re ready to win obscure trivia questions about birthmarks! You’re welcome. It’s not always easy to see, but check out the way her teeth are pushed over from the port wine stain on her right to the left — lots of activity on the right side! Lots of extra blood flow for growth. Addy graciously let me photograph the inside of her mouth; the port wine stain invades her mouth, but only on the right side. That is a picture of Addy, standing up in front of thousands of people, to give a speech and handle a live Q&A. My darling birthmarked baby, whose port wine stain made us wonder how she’d face life, got up and did this three times in a row, overall speaking to 30,000-35,000 people last weekend. Addy had the immense privilege of being asked to speak at Eagle Brook Church, one of the largest churches in our metro area, as part of a sermon on God’s strength showing up in our weaknesses. This was our first time being there. Here is the link to the recorded service; I recommend the whole message (38:06 if you click the “Message Only” button), but if you want to skip ahead, Addy’s segment starts at about 24:30. Dr. Merritt (“Pastor Bob”) researched meticulously. I only met him shortly before Addy went up on stage. I didn’t even provide the photos; he picked them from my blog. I didn’t provide him much commentary at all. Everything he said about our story, he distilled himself from the words I’ve written here – and I couldn’t have distilled my own words better if I’d tried. This man isn’t kidding when he says he’s anxious about speaking his messages; it makes him prepare carefully, and God moves powerfully through it. His message resonated. 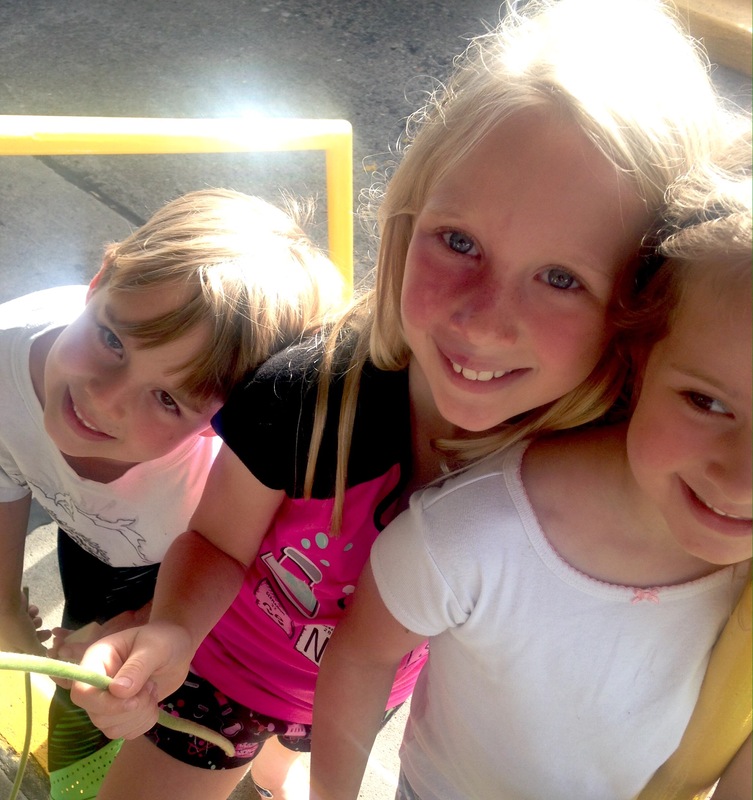 Addy may have helped it resonate, but it was deeply moving long before she ever got there. I was touched by how well he told her story. He and his staff warmly welcomed & closely shepherded us through the weekend, and I am immensely grateful for it. I now understand the immense anxiety of powerlessness. This event, this speech, this privilege, this moment was in the hands of a ten-year-old kid, and there was nothing I could do to prevent disaster or help mitigate a single thing. Once she left the backstage ‘green room’ with her mic clipped to her little uniform jumper, it was all on her. This wasn’t life-or-death. This wasn’t major surgery, handing off the car keys, or freshman year of college. But I was sending out my little girl, so tiny on that stage, to speak a speech and to handle live Q&A in front of thousands. If she froze mid-speech, if she fell off the chair, if her jumper caught, if she got sick, if she answered awkwardly, if anything happened to her that we’ve all seen happen to other people in public, there was nothing I could do. Thousands were watching. How much will therapy cost if this goes sour? She remembered her speech. She even remembered to do the shortened version. Twice she accidentally launched into the longer version, but soon caught herself and smoothly jumped down to the right spot in the speech without anyone even noticing. She answered Pastor Bob’s questions. It’s so easy for humans to give mistaken answers, to blurt out something embarrassing by accident; adults do it all the time, and even professional talking heads do it and lose their jobs. But she answered them just fine. I don’t think I breathed until the applause began and she could leave the stage. She got three standing ovations, from a quiet northern congregation that doesn’t do standing ovations. What do I say, after such a weekend? I am rarely stuck for commentary, but I’m coming up short right now. Readers, you know Addy’s journey. Many of you are parents of unique children, too. You’ve hoped, like we have, that your baby will be able to simply walk into a classroom someday without feeling embarrassment or shame. That’s a high-water mark that we don’t take for granted. We can’t. Moments of this exhilarating magnitude are definitely not guaranteed, let alone expected. But they’re possible. And not just in spite of, but perhaps because of, that uniqueness. May her words (and Dr. Merritt’s) encourage you. Had to share this before I forget! It only took me 6 months, but I’m finally sharing three videos I compiled when Addy had a recent laser surgery. This is the first time I’m sharing a video glimpse into our conversations, so this will be a chance for our far-flung readers to meet Addy in action. The context: For the first time, Addy would walk into her dance class with a very bruised face. And there would be some at school who might notice the change. So, since she’s old enough, I conversed with her about the experiences and tried to catch as much as I could on camera. First, I share my thoughts on how to approach these conversations. Parents, you hold a significant responsibility as the person your child looks to for help judging if an encounter is positive or negative. And no matter how indignant your adult-with-baggage self may feel when you see your precious child fielding questions, remember that these encounters don’t have to be negative! Handle life with humor and grace, and your child will absorb your attitude. Finally: after dance class, with some help from Elly. We debriefed the experience, and I intentionally kept my attitude up for her sake. Our three kids (Addy, Clarence, and Eloise) and I went to the farmer’s market early Saturday morning. 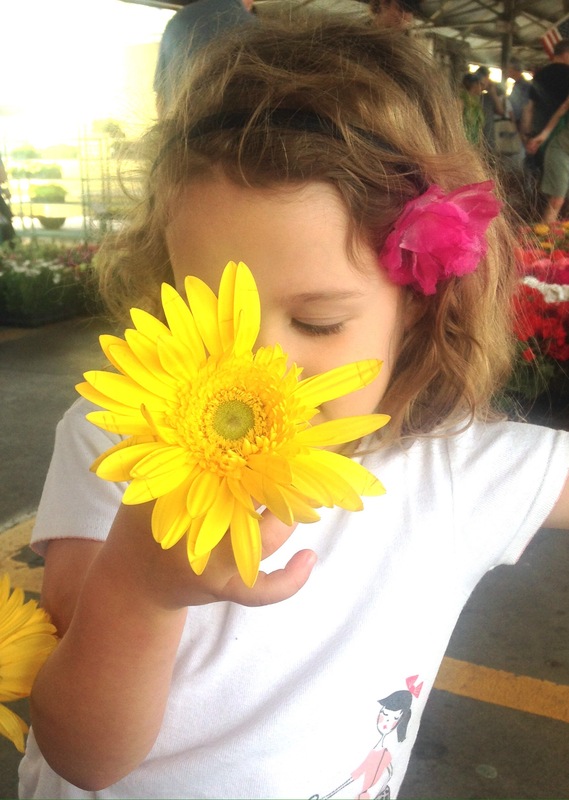 Halfway through, a kind flower vendor handed each child a free daisy – lovely, rich yellow with strong green stems. The children received the gifts with wonder (apparently, I don’t do enough cut flowers in my house) and carried their treasures around the market carefully. Not 10 minutes later, I heard Eloise shriek with a stumble and saw her hunched on the pavement sobbing. 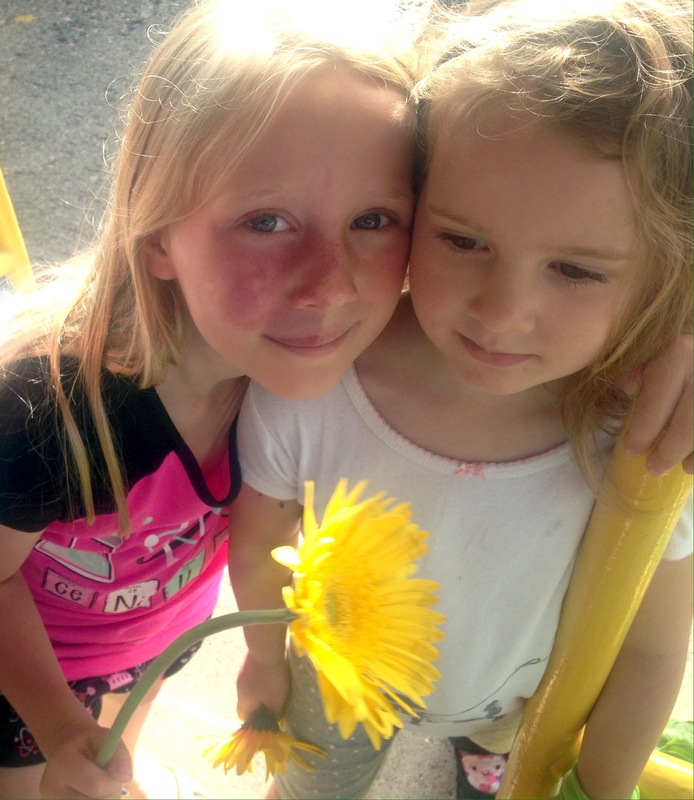 I tried to help her up (at age four, random falls aren’t uncommon), but she pushed away my help: the injury was not to her but to her daisy, and she wanted to protect the scattered yellow petals for rehabilitation, panicking that I might step on them. Her grief was intense as she grappled desperately for the petals and tried to stick them back on her flower, and she sobbed even more when they fell back down. I squatted down to join her and helped her cradle her daisy protectively. I softly agreed that it was very, very sad that the daisy lost its petals. “But, Eloise, look – it still has petals. It still has a lot of petals, doesn’t it?” A choked sob was all I could get for a ‘yes’. Elly, who admires her Beautiful Big Sister as only a little sister can, nodded thoughtfully and sniffed, “Right”. She let me help her up, still cradling the daisy, and we continued through the market. I heard no more sorrow about the damaged flower. If you know Eloise, who inherited all our passionate Irish blood, you know how rare it is for her to let an injury go without further comment. But she enjoyed her flower for the rest of the morning as if nothing had happened, and let it go when it finally faded later that day. Sometimes I simply hand the parenting baton off to my eight-year-old Addy, knowing that I’m no longer needed at a particular moment. In her love of Truth, she acknowledged honest damage; in her wisdom, she saw its beauty, and in her confidence she pushed that vision out to her sister. And little Eloise got her flower back.